This is not the rollerblading you came to see. At least for our regular readers it probably isn’t. There’s no grinding. There’s no street skating. Hell, there’s not even any “aggressive” skates. 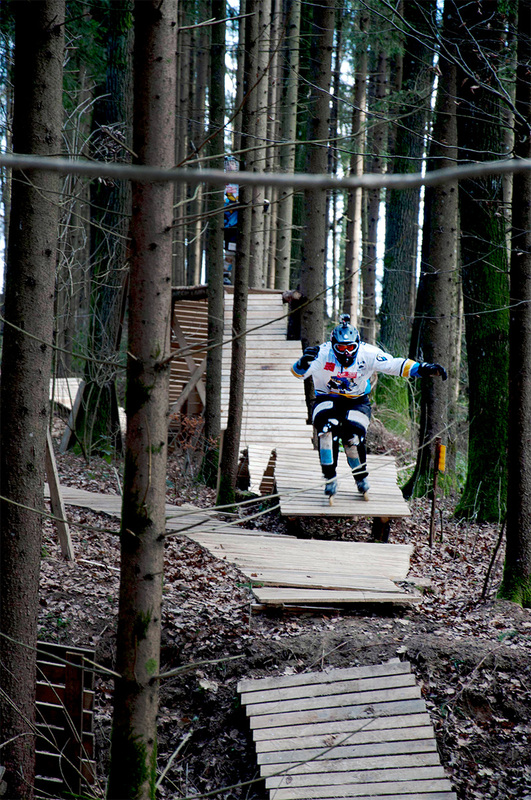 Instead there’s three dudes throwing themselves down a custom-made wooden race track in an Austrian forest that they call the Couch Garden Training Track. After posting the above edit on October 6th and ranking in over 150k views (YouTube & Vimeo), Luca Dallago, one of the three skaters in the edit, hit us up to make sure we saw it and to know what we thought. What followed was a crash course in Crashed Ice, and lots of discussion about blading. Finally we decided a proper interview was in order, so that’s what we have here. And as I write these words, something becomes oh so clear. I can guess where training facilities will turn up in the US, and it rhymes with “schmoodmord.” Wouldn’t that be something? Okay Luca, thanks a lot for reaching out to us — the edit you guys made is awesome and we’d like to know some more about how it came about. So I guess let’s start there: who are you guys and why did you build this crazy skate course in the forest? Well, “we” are a group of Austrians, with the addition of one crazy German guy, who took it upon themselves to progress the sport of Ice Cross Downhill (better known as “Red Bull Crashed Ice”). It all started when my brother, Marco, and I were in Vienna to visit our “Crashed Ice” colleague, Simon Schaerf. Simon is a graphic designer. And so is his brother, David. David and I began to talk about crashed ice and how you could progress it. The biggest problem is the lack of training opportunities — There are 100,000s of people that want to try it out. But most of them don’t have the chance because there are only about 200 participation spots. 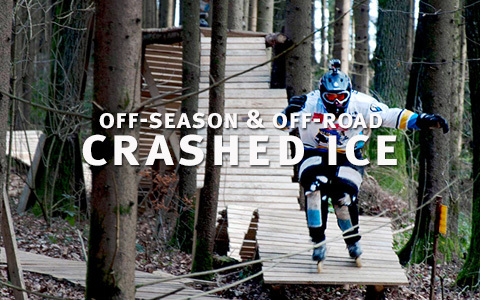 Ice Cross Downhill is not like rollerblading, where you just call your buddy and go to the skatepark. You have to qualify first. So he put the idea in my head that there has to be some form of it, more fitting for a mass market. I was really excited because I could do something nobodydver done before. After about two months of testing different skates and surfaces to ride on, we decided to build it with wooden planks. Andreas Wirnstl (the third rider in the edit) joined us. The Schaerf Bros called up their friends, Martin Beisteiner (professional camera man and editor) and Markus Knoblechner (head of Austria’s biggest longboarding community and photographer), and we came up with a storyline for the video and started to film. With your backgrounds in ice hockey, did you spend time on blades doing the off-season cross training thing? Or is the whole idea of you guys being on blades an in-joke for the Crashed Ice crowd? No, we actually train on our track. It’s one of the reasons why we built it in the first place. We hope the Crashed Ice guys get inspired by it and maybe build their own tracks next year. Speaking of that, how did you get involved with Red Bull’s Crashed Ice? My brother saw some videos of it on the internet, wanted to give it a try, and qualified for his first race in Munich back in 2011. A year later, Marco took me to a practice track in Austria. It was the most insane feeling, going down that ice track, but back then we both were pretty busy playing hockey. However, the door to a professional hockey career soon slammed shut, but the door to the Ice Cross Downhill world opened, so we joined the tour and competed throughout the whole 2012/13season. For real, we don’t know too much about Crashed Ice because, like, it’s not blading — but how many events are there and how much traveling are you doing to be apart of it? Yeah, it seems like almost everyone has seen footage of a race at some point, but nobody knows more about the sport. It’s existed since 2001, but back in the early years they had just one or two races a year on really rough ice conditions. Since 2011, there are four to five races a year, with stops in the US, Canada and Europe, with a World Champion being crowned at the end of each season. My brother came close to the title last year with a stellar rookie season, finishing fifth overall. Does it pay? Is there a growing community of people working, like you guys, to train and whatnot? How does that normally work without, you know, a custom-built forest track? The sport gets bigger every year, and more and more people want to be a part of it. As far as I know, we are the only riders to have a “custom-built forest track.” We’re not the only ones to train all year for the events though. A big factor for success in our sport is a fast start and good endurance. So the guys lift a lot of weights and work on their overall conditioning during the summer. However, a fast start doesn’t help much if you can’t handle the speed. To train this aspect, skiing and mountain biking helps, but nothing’s quite the same. Except for our forest track, of course — he he. As for the money — there’s no one on the circuit who’s a real pro. But if you’re one of the top skaters you can collect prize money and get some sponsors. Fortunately we have good media coverage, but there just aren’t enough races to do it professionally… for now. How many days are you on-track training every year? The biggest problem our sport has is the lack of training opportunities. Most of the World Cup Tracks are built through the center of cities, just for one weekend of racing action. So, basically we got two days on the downhill course per event. There are a couple of permanent tracks also, but not in Austria. So yeah – we spent a total of 10 days on downhill ice courses last year. It’s really frustrating, imagine you could only go blading for 10 days a year! Thank god we got our own wooden track now. And what’s the division of BudderUp? BudderUp is a brand that David Schaerf started with one of his Australian friends. It’s all about surf, snow, skate and lifestyle. It’s a startup right now. 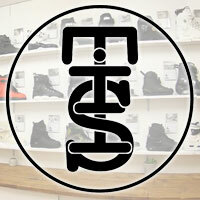 We like the philosophy of the brand so we help to build it up. How much planning and prep went into the edit? Who’s idea was it? Building the track was a lot of work, but we didn’t plan too much about the edit. We had a rough idea of what we wanted the video to look like, but most of the creative stuff came shortly before or while we were filming. We kind of just let it happen. The real effort happened when we were done filming. Martin and David locked themselves in a room for two weeks and worked night and day to cut all the scenes together and finished the edit. Yes, some guys went down with almost no protection, but it didn’t take too long before they put on more gear. It’s really hard, especially at the beginning, and you crash a lot. There’s very little room for error and lots of ways to get hurt on the track: Your fingers get stuck in the gaps in between the planks and you break them. Yyou go down with lots of speed, no breaks, and there are trees everywhere. I know you guys take a lot of pride in doing gnarly stuff without any pads on, and I really respect that, but if I would have trained without my gear, I’m pretty sure I would be laying somewhere in a hospital by now. What sort of exposure do you, since you reached out to us, Luca, or the other guys have with our world of unruly youth destroying property with freestyle blade antics? Got any favorite skaters? Been to any events? Frankly, I knew close to nothing about the world of rollerblading before I started this whole project — shame on me. At the beginning I did some research to get some inspiration and watched a lot of videos. Yeah, and after our edit was out I contacted you to see if you wanted to spread the word. I just wanted skaters everywhere to see wha else is happening on blades in the world. You mentioned before that you guys were gonna be on the cover of the Red Bulletin next month. You ready for that? Ha ha, I don’t know about the cover but we’re going to be in it somewhere. We already had the photo-shoot, which was a great new experience for all of us. The pictures look really awesome — unfortunately I heard that we’re just in the European version of the magazine. What’s next for the BudderUp crew? 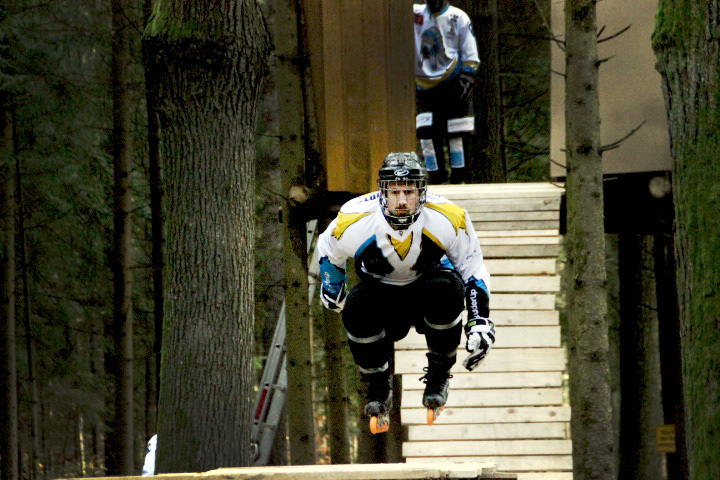 We want to take this whole inline downhill thing to the next level. We are working on concepts for that but unfortunately I’m not allowed to talk about it here because everything’s top secret for the moment. But if we’re successful you’ll hear from us again, ha ha. Anything else we should cover before we let you get back to prepping to hurl yourself down an icy death-chute? No, I think it’s a wrap. Well thanks for getting together with us, Luca, and we look forward to seeing what you guys deliver next! Best of luck this year on the circuit, and let us know if we’ll get a chance to see you somewhere near Southern California. We’ll take you to the skatepark. Thanks Justin! Yeah, would be great to check out the skateparks in California. And if you ever happen to be in Austria, let me know. I’ll take you to the forest track. Good thing they were wearing hockey pads!